To say that I am thrilled to be presenting a talk at Confab Central this coming May would be a hu-freaking-mongous understatement. 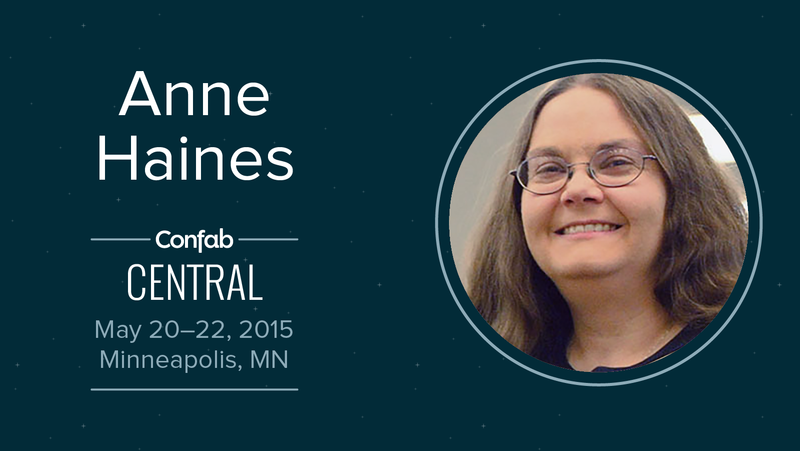 Confab is THE conference on content strategy, and it’s a ridiculously great experience. The first year I attended (2013), I arrived in Minneapolis as a newbie with a strong interest in content strategy and a desire to learn more; I left feeling confident in saying that I am a content strategist. It’s a conference full of presentations that make me think and teach me new things, impeccably organized by smart, friendly people who think of every detail to make sure attendees can use all their energy on learning and connecting rather than having to stress out about logistics, and it fosters a lovely community of content strategists that has been an amazing resource for me throughout the year. So you’ll understand why, when I submitted a talk proposal and got the email that it had been accepted, I literally sat at my desk staring at the email with my hand over my mouth for a good two or three minutes. I felt like I’d just been given a ticket to Cinderella’s ball or some such. It was incredibly flattering to think I might have something smart enough to say in that setting. My talk is titled “If She Knew What She Wants: Librarian mind-reading tricks for fun and profit.” (That link will take you to a short summary of the thing on Confab’s website.) It’s something I’ve been chewing on for a couple of years. A lot of content strategy work is all about communicating with our clients, stakeholders, colleagues, and so on. And a lot of that communication revolves around problem-solving, in one form or another. The first step in working with someone to solve a problem is to make sure you both know what that problem actually IS. Right? This is also what happens in reference librarianship. A patron will come to the ref desk (or get on your “Ask a Librarian” chat, or email you, or whatever) with a question, and part of what you have to do is figure out what it is they really want to know. I mean, if they start out by saying, “I’m looking for a book” – grabbing a random book off the shelf and handing it to them isn’t the answer they want! Okay, that’s a little extreme; that’s like someone asking “Do you know what time it is?” and answering “Yes.” (I know you do that. Smartass.) In that case, you know good and well that there’s more to the question. More complicated questions work pretty much the same way. Except more complicated. And that’s a lot like what happens in content strategy. If a potential client contacts you and says “Hey, I need some content for my new website” – you can’t just send them a dozen random PDFs and an invoice and call it good. Right? (Except again, usually, more complicated.) There are times when someone needs stuff from you, and unless you figure out how to work together with them to figure out what it is they really need and what you can do to fill that need, you’re screwed. My theory is that the reference interview techniques that librarians have developed over the past 50-75 years or so will actually be helpful to content strategists who are working with stakeholders who need their problems solved. So I’m working on the talk. (Except when I think, hey, let’s write a blog post. Um, procrastination much?) And in the information gathering stage, I’ve gone back to read some of the basic writings about reference librarianship, in particular the reference interview. A lot of this is stuff I read back in library school, 15 years ago or so, before I had any reference experience whatsoever. I’m reading Robert Taylor on question negotiation, Dervin & Dewdney on neutral questioning, and so on – also some newer work that’s come out since I was in library school (oddly, in school I didn’t read much about how reference interview techniques might or might not apply in a chat-reference situation – since, you know, such things didn’t really exist back then!). I’m also going back to a few of the basic content strategy texts – Halvorson, Kissane, people like that – to see what they’ve said about communicating with stakeholders, and to sort of check myself to make sure what I’m talking about really DOES apply to this kind of work. It is so, so interesting to go back to the basics of something when you’ve been actually doing that thing for a while! Some of the literature on reference work that seemed really dry and theoretical before makes SO MUCH SENSE now. Turns out, I must have really paid attention to Dervin & Dewdney in library school, because neutral questioning (which some writers have redubbed “sense-making questions”) is something I do all the freakin’ time now. And not just when I’m at the reference desk. Woe betide the Facebook friend who posts something like “hey, can anybody recommend a good restaurant in Bloomington?” because I will inevitably come back with questions like “hey, what kind of restaurant are you looking for? what kind of meal do you want? what’s the occasion?” I mean, I need to know stuff like that! Otherwise I’m going to send them to the downtown Bakehouse (which is where I’m sitting right now to eat a veggie burger and a lemon cupcake and to write this post) without realizing that what they want is a place for a kinda-fancy, but not necessarily pretentiously-so, place for a celebratory anniversary dinner. In which case, maybe go a couple blocks away and try FARMbloomington. By the way, if you wrangle web content in any way, I cannot possibly say enough good things about Confab. You should go. You really should. It’s not cheap (tip: if you enter the discount code HAINES2015 when you register, you can get a discount equivalent to the early-bird rate that you missed out on a while back), but if you can get your workplace to splurge a little, it is so so worth it. (I haven’t even mentioned the fact that they feed you really well. Breakfast, lunch, and all the snacks you could possibly stuff into your mouth between sessions – and we’re not talking stale muffins or rubber chicken either, the food is always super great!) For a much better-articulated post describing what’s so great about it, go visit Jonathan Colman’s blog post on “Why You Should Go to Confab.” And hey, if you go, you can hear me speak a little more coherently (I hope!) about the reference-content-strategy-problem-solving-hoo-ha stuff I’ve rambled on about so ramblingly today. If I ever get the dang talk finished, that is. Time to get back to work! See you in Minneapolis? I’m working my every-other-Monday split shift, 10-3 at my desk and a 6-9 pm shift on the reference desk. The news of the Boston bombing breaks just as I am on my way out of the building to get dinner. I spend my dinnertime – usually a relaxing couple hours of reading, journaling, enjoying a rare leisurely meal – scrolling through tweets on my phone, trying to sort out the credible from the sensationalistic and the rumormongering and the well-meaning-but-misinformed, trying to share what information might be useful to my friends and my friends’ friends, calling on Boston friends to check in, please. (They do, and they are all fine.) Because this is what we do. We connect. We crave that. I text a friend. I mean to type “human beings” but it comes out “human wings.” We are hurtling through air, we are moving so fast we can’t stop, we are much too far from the loam and gravel of the earth – or so it seems sometimes. Later, I am at the reference desk. I am surrounded by windows, and on the other side of those windows are trees breaking into bright green leaf, sunlight filtering through the awakening branches. Beauty, beauty. In between questions I continue to poke at Twitter and other sources of information both good and bad. I read that one of the people killed in the bombing was an 8-year-old child. I don’t know whether this is true or not (I find out later that it is), but after that I find it difficult to smile. Here in Indiana, we are many hundreds of miles away from the horror. We are living our lives. I remind myself of this, remind myself that all we can do is keep on living. I think about a presentation I attended at a conference a few days ago, which described a study of “librarian approachability”; one of the conclusions was that librarians at the reference desk are more approachable, easier to ask for help from, if they smile at patrons. I remind myself to smile. There is nothing I can do from here, really, but to try to do my job. To help people find the information that they need. To help them feel welcome here. To share a moment of kindness. I try to meet their eyes as they walk past the reference desk, a little more than I usually do. I try to smile at them, and some of them smile back. That’s all I can do tonight: just try to share a little kindness, try to make some human wings feel welcome on this hard planet of ours.